Hunting Monsters: "Our hands are tied"
I saw a Socialist Party MEP on the news talking about how if the referendum on the European Stability Treaty thing was passed then Ireland would be stuck with austerity budgets forever – no future government would ever be able to break out of this austerity straitjacket. I am not entirely convinced by this. 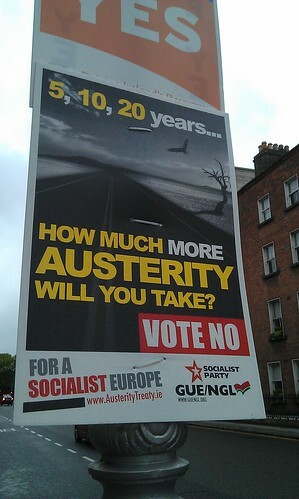 For one thing, I suspect that if the Socialist Party are ever leading a government they will not say: "We would really love to bring austerity to an end, but alas, our hands are tied by this treaty". There might be a deliberate missing of the point with what is being voted on in the referendum going on. If passed, it allows the state to ratify the European Stability Treaty thing. The actual terms of the Treaty thing are then incorporated into Irish law by ordinary legislation. I am no lawyer, but my understanding is that at some future stage these provisions could then be taken out of Irish law by future legislation – ordinary legislation, not a consitutional amendment, as the constitutional amendment in the referendum merely allows the state to ratify the Treaty thing, but does not require it to do so or require it to stick to the terms of the Treaty thing forever.